Dec 12, 2015 @ 10:00 AM — by Retina Associates, P.A. At Retina Associates, P.A., we offer a comprehensive range of treatments for retinal conditions, including macular holes. The macula is at the center of your retina and, as such, is essential to your central vision. It also plays a vital role in your ability to discern vivid color and crisp, sharp detail. The structural integrity of your macula is paramount to the quality of your vision, whether or not you require visual aids to focus at given distances. 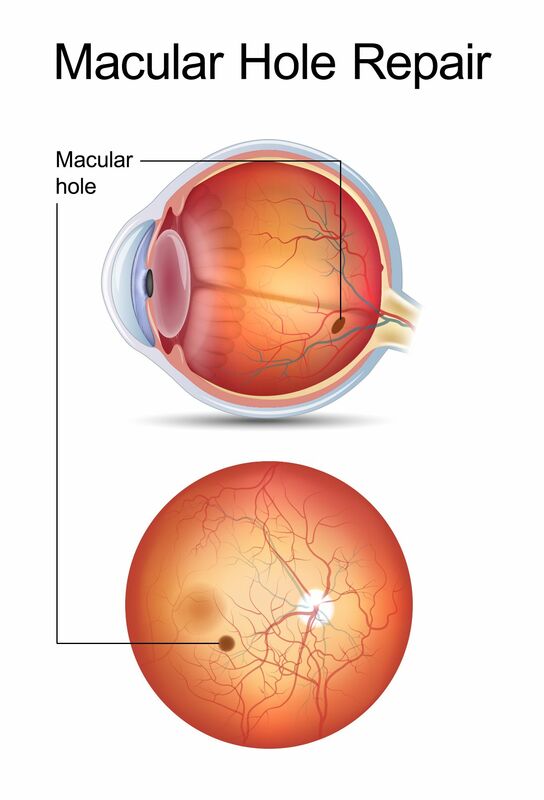 Like macular degeneration, macular holes interfere with a person’s central vision and are most common among those over the age of 60, though they can affect people at any age. They generally affect only one eye, but can affect both. If you have noticed grey or black spots, blank areas, or other visual distortions (such as normally straight objects appearing bent) in your central field of vision, then you may have macular holes. It is important that you schedule an eye exam immediately. We invite you to read about macular holes and their causes and treatments as provided by our Kansas City retinal experts, and then contact Retina Associates, P.A. today to schedule your initial consultation or comprehensive eye exam. Unfortunately, the most common cause of macular holes is one that cannot be prevented: aging. Over time, the vitreous - the gel-like substance that fills the eye and allows it to maintain its shape - gradually shrinks and pulls away from the surface of the retina. This is a natural process that is normally harmless. The body compensates by filling the space once occupied by the vitreous with fluid, and most people never experience adverse side effects. In some people, however, the vitreous maintains some of its grip on the retina as it contracts, pulling on it until it tears and creating a hole. At this point, the fluid that replaced the vitreous in the eye seeps through the hole, distorting the central vision. How Are Macular Holes Treated? Fortunately, macular holes can effectively be treated, especially when they are diagnosed early in their formation. The most common treatment for macular holes is a procedure called vitrectomy. This safe, time-tested procedure involves the removal of the vitreous from the affected eye and its replacement with a mixture of air and gas. This mixture forces the torn edges of the macula to remain in place so that they can heal. As the macula heals, the gas and air mixture is resorbed into the body and replaced with natural fluids. Patients must maintain a face-down position for a period prescribed by our surgeons in order to ensure the success of the surgery. To learn more about macular holes, please contact Retina Associates, P.A. today.